Forbo Flooring based in Ripley Derbyshire has invested £4.1m in a new project which will increase manufacturing capacity and efficiency following the purchase of a new £3m Double Belt Thermofix laminating machine that makes floor coverings. Heavy machinery moving specialist Joseph Merritt Group Plc was appointed to store, move and install the new machine. Forbo Flooring has manufactured the ‘Flotex’ brand for over 45 years. 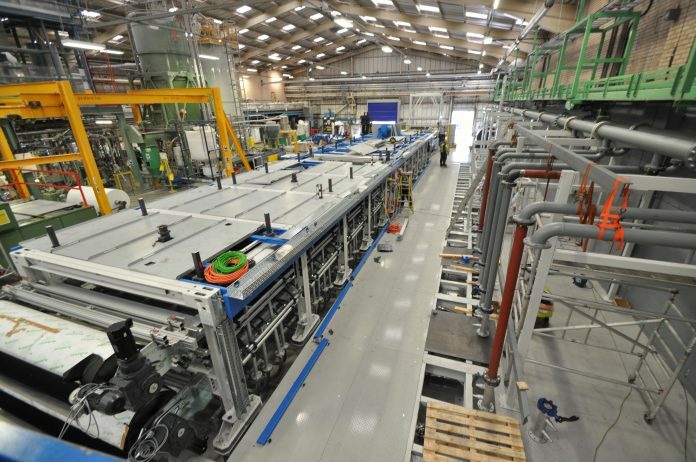 The Double Belt Thermofix laminating line was purchased to replace the existing 17 year old production facility which makes a recyclable substrate from the Flotex manufacturing waste and is then laminated on another production line to make the new tile & plank range. Corey Edwards, Forbo’s strategic project manager, was responsible for delivering the project. He said: “The investment will streamline and speed up the production process for this particular product and we are hoping this will deliver a quick return on investment. The main machine was manufactured by IPCO who are based in Germany. The machine ancillaries which control the upstream/downstream were manufactured in Italy by Erhardt & Leimer Ltd.